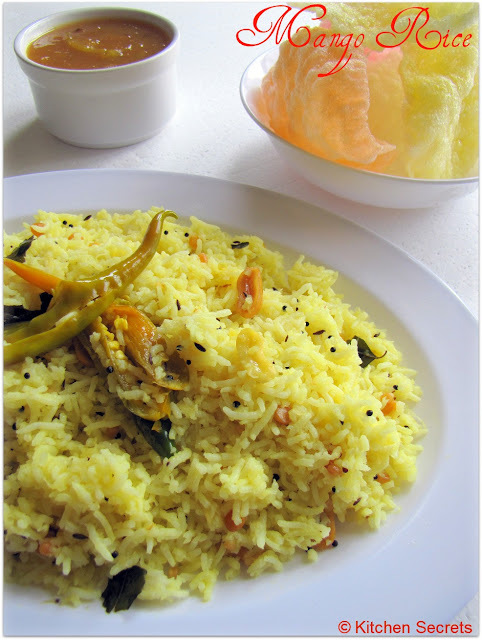 A simple yet my favourite one pot meal is this mango rice. U can make this rice in no time , ofcourse u can use any other veggie ( which gives flavour to the rice when cooked ) rice following the same method . I's so happy to make this rice when VJ said he is gonna eat outside , I know, u guys must be thinking, what ..?! Yep, again the same fact, he hates mango. Before my baby A , I used to make two seperate meals, one for me and the other for VJ , But now, I hardly find time to make one quick set of meal, ohh yeah, he is keeping my hands full, all day.. :) . At the same time I grab every single opportunity to make my tummy happy by making such kinda quickie yet delicous n flavourful meal..
Take a wide bottomed kadai and pour the oil and ghee together. Add the mustard seeds once the oil is hot and let them crack. Then add the hing . Now add the cumin seeds and fry them. Later add channa and urad dal and fry them in the medium low heat until they turn golden. Add the peanuts and cashewsd as well. Fry them till they turns crisp. Now add the dry red chillies and mix them well in the oil. Drop in the grated mango along with the green chillies and turmeric powder and saute them for 2 minutes. By the time, all the juice from the raw mango must have been gone . Now add the required salt and mix well. Slowly add the rice and combine well with the mango masala. Serve hot with Sago Fryums .. I feel so hungry just looking at the click. Pass me a plate. Fantastic n droolworthy tempting mango rice...lovely! Your rice has cast a hunger spell on me! too yummy looking! love to have this tangy mango rice anytime... the presentation is so homely... yummy..
wow mango rice looks so colorful and yummy !! My fav. Drooling here looks yummy. oo mouthwatering here....Lovely mango rice.. I am waiting to get some good green mangoes and my fav Mango rice....ur is just too tempting! baby is always a handful rt...? This frequents my kitchen in summers, looks so nice. Just reading the title itself i am drooling. :) How i wish i had raw mangoes here. Super duper delicious. Yummy mango rice, very tempting! Fantastic n drool-worthy tempting mango rice...lovely! 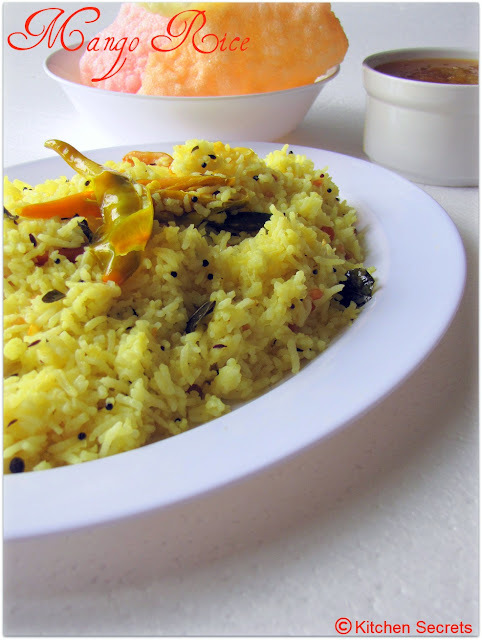 Mango rice looks delicious, awesome one pot meal. yummy! mango rice in one of my favorites ! With those papads on the BG,looks so so tempting,loved it!